Turkey, which was once a model for democracy in the Middle East, is skirting dangerously close to autocratic rule under its current leadership. 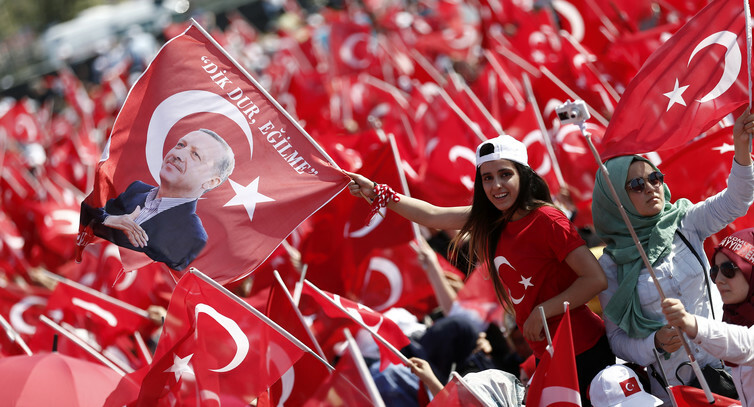 The recent failed coup attempt led to a massive crackdown on the government’s political opponents – and, in particular, the increasing personal power of Recep Tayyip Erdoğan has been a cause for concern. To his supporters, Erdoğan is a strong father figure that the country can rely on – clearly, he has a lot of genuine support. But to his critics, he is a dictator in the making. Are they right to be so alarmed? Is Turkey really becoming a dictatorship? Certainly the integrity of its democracy is under threat – but whether “dictatorship” is the right word is another question altogether. In the past, scholars used broad strokes to differentiate democracies and dictatorships: where as democracies enjoy free and fair elections, civil liberties and political rights, judicial independence and the rule of law, dictatorships do not hold elections, restrict freedoms, and suffer rampant corruption. This very simple typology is useful enough for distinguishing between, say, contemporary North and South Korea. But there are plenty of regimes that fall somewhere in between democracy and autocracy – so-called hybrid regimes. Hybrids hold elections, allow opposition parties to run candidates and may even permit some civil liberties and openness, giving the veneer of a democracy. They maintain some or all of their democratic institutions – though they don’t necessarily function well – and their leaders face no serious democratic challenge. Today more than ever, most less-than-democratic regimes around the world can be considered hybrids. Why are there so many? Though various authoritarian regimes have long used dubious elections to appear more democratic (Angola, for instance) many others are experiencing what’s called “democratic backsliding”. Previously flawed democratic regimes are appearing more and more authoritarian. One of the most common forms of democratic backsliding today is executive aggrandisement, where the executive in charge of the state weakens the checks on their power by undermining the legislature, judiciary and opposition, while relying ever more on referendums to acquire a “democratic mandate”. Under Erdoğan’s leadership, Turkey has become a textbook case. Erdoğan came to power shortly after his Justice and Development Party (AKP) won in a landslide election in 2002 and immediately began making his mark on the country; more than 500 laws were passed during his first two years in office. In 2010, to demonstrate his mandate, Erdoğan passed two dozen constitutional changes via a national referendum. This played into his hands, garnering the support for his policies from the rural masses, where he receives more of his support. Meanwhile, some of the civil liberties that had improved in attempts to achieve the criteria for European Union membership have drastically eroded under his leadership. Media freedom has been curtailed. Websites can be blocked. TV coverage is limited. During the 2013 Gezi Park protests, more than 80 journalists were fired. Journalists can be prosecuted for discussing any subject deemed controversial by the government. Erdoğan also worked to weaken the judiciary. He gained the power to name 14 out of 17 Constitutional Court judges. In 2014, 3000 sitting judges were removed. Instead of the courts, the AKP controlled legislature now decides which parties are able to compete in elections. Then, in 2015, the National Intelligence Organisation (headed by a presidential appointee) was given the power to collect “all information, documents or data from any entity in Turkey” without having to seek judicial permission or submit to judicial review. Since the recent coup, more than 2700 judges have been removed. Overall, the response to the failed coup has been anything but measured. The state crackdown has resulted in the arrest of more than 16,000 people and at least 60,000 have been fired or suspended from their jobs. This is very much what you would expect from Erdoğan, who some have accused of a lust for power that’s “too great for him to show restraint in stifling opposition in general”, and has even been said to aspire to an ”imperial presidency”. It remains to be seen whether Erdoğan will succeed in profoundly transforming the Turkish state into a true autocracy, rather than the hybrid regime it’s well on the way to becoming. But wherever he’s headed, his efforts to concentrate power mean he must shoulder some of the blame for the recent instability and terrorist violence that Turkey has suffered. His personalisation of power has led to a series of deadly missteps, not least an alarming passivity in the face of the growing threat from Islamic State. Dictator or not, Erdoğan must radically change course or step down altogether if Turkey’s democracy is to be stabilised and secured. But given the resolve he displayed after the July coup attempt – combined with substantial popular goodwill – that seems as unlikely as ever. ← Has Angela Merkel made German integration issues worse by letting in a million refugees?